In my determination to experience as many Japanese things as possible before going back to the UK and leaving without any regrets (as they say, better regret what you’ve done, not what you haven’t) I was more than happy to accept an invitation from the ladies from my Nihongo Kurabu to go and see a Kabuki play. It doesn’t get more Japanese than watching Kabuki, not only because it is a traditional Japanese play dating back from the 17th century, which combines a story line with traditional dancing, but also because it displays some amazing traditional Japanese costumes, intricate makeup and of course all the lines are related in Japanese. Plus, who wouldn’t want to go and see a stage full of men (yes, they even play the female roles called onnagata) wearing full makeup and female kimonos while trying to move as gracefully as possible. So off I go on a Sunday morning, after much debate on what the dress code would be. I decide to go for a safe option with a skirt and plain top (Japanese women love skirts and pretty dresses, so I tell myself I can’t go wrong there). But to my surprise when I arrived at the theatre, it had nothing of the glamour I expected, with many guests wearing casual outfits ( when I say casual I don’t mean by European or American standards, but casual for Japan, which in itself is 3 steps up from casual casual). In any case, in we go and are shown to our seats (and by that I mean literally taken to our seats and not just waved in a vague direction towards where our seats are supposed to be). Not the greatest seats in the house but considering that with a student discount we paid about a third of the price of a standard ticket, it is no surprise. I start looking around and the theatre seems to be filling up, suggesting that it is a popular play. Then I notice that a few of the foreigners seem to have a little translator gadget to help them with understanding the play and I am told I can get one from the lobby for a set price but in my stubbornness I refused to do so as I want to enjoy the whole experience without somebody speaking in my ear in a very bad English (as I have previously come across on other occasions). Anyway, a woman’s voice starts to make an announcement in Japanese. I try to concentrate, so I make up that the play would start in 5 min and everybody should take their seats. She also mentioned something about taking pictures, but I cannot quite understand if she meant we are allowed to take them or they are prohibited. I guess I would find out soon enough. And off they start. 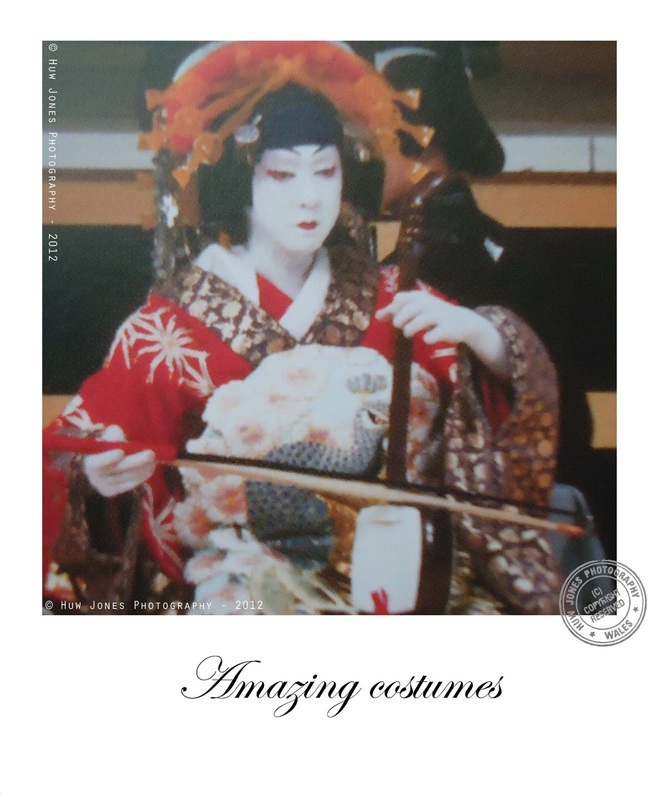 The beginning was quite interesting as 2 male actors appeared on the stage and for half an hour they explained a little bit about the history of Kabuki and what each part of the stage was called, what it meant and how it was designed. It was fascinating to see all the traps and rotating platforms and considering the stage set up hasn’t changed much in the last 3 centuries it is amazing to think how they managed to handle everything at the beginning. 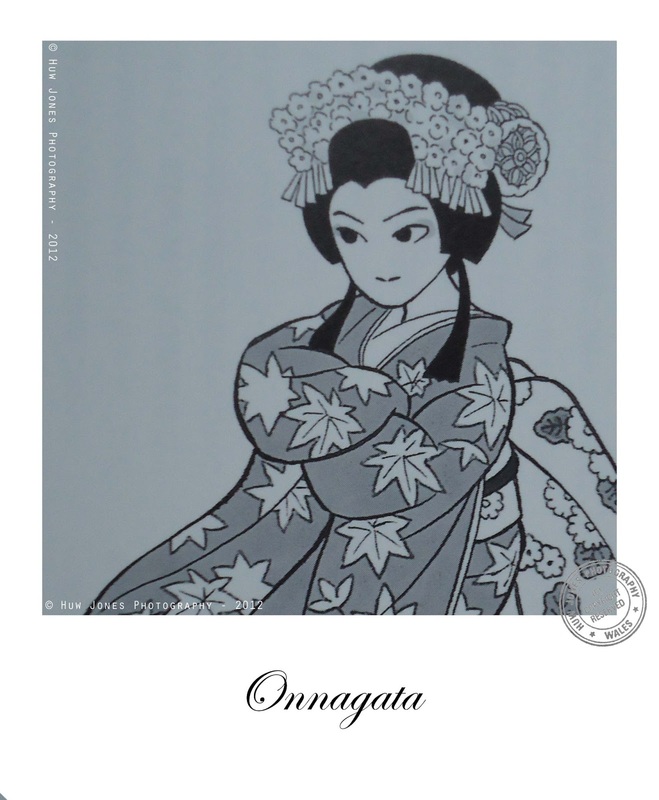 The explanations were quite easy to follow so I gain a little confidence and tell myself that by the end of the play I will be an expert in understanding Kabuki. But oh, how wrong I was indeed! With the explanations done and dusted we take a 20 min break for the stage to be set for the play itself. The curtain comes up and the colors on the stage are so bright and beautiful that it makes everybody gasp in awe. Off I go taking a picture with my Iphone (I couldn’t believe I left my camera at home!!!!!!) and then the play starts. Now this particular play was called ‘Momijigari’ and a small summary was presented to us beforehand by the ladies from the Nihongo Kurabu. I thought this would help with following the story, but I did not realise that the play would be entirely related in high pitched voices that seemed to follow a certain rhythm and which made everything very difficult to understand with my limited Japanese. In any case just watching the intricate stage decor, the amazing costumes which had such vibrant colors and the fascinating makeup, sure kept me occupied for at least another half an hour. During this time I also happily and blissfully took some pictures (not very good I might add) until I was told off by a theatre assistant (so I guess what they meant at the beginning was that picture taking was NOT allowed- oh well J ) . But without this to keep me occupied I have to admit that half way through even I, in my dedication to experience this famous Japanese form of art, barely managed to keep my eyes open and in true Japanese style, was close to falling asleep. Only towards the end I notice that on each side of the stage there were some small screens that displayed all the lines the narrators were saying and although in Japanese, they might have helped me a little bit more with my understanding, if not at least with some kanji practice- LOL. In any case, I could say I’ll know better next time, but I am afraid there will be no next time, because although an experience I am glad I had the opportunity to encounter, it was not as enjoyable as I hoped it would be and therefore not on my list to be repeated. Kabuki watching, like many things Japanese, is an acquired taste. 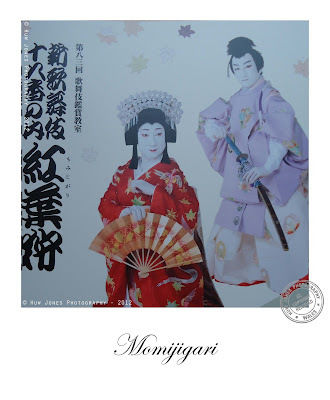 However, it is also something I recommend to everybody visiting Japan for a longer period of time, to experience at least once in their quest for understanding a little bit more of the Japanese culture. Not so great iPhone pictures, but still part of the experience.